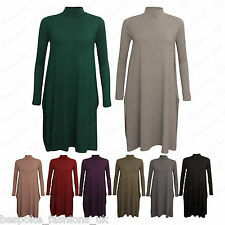 Next ladies black roll neck work dress - skater style. Size 14. Perfect for work with a suit jacket. Condition is Used. Dispatched with Royal Mail 2nd Class. Size 12 V by Very Burnt Orange Floral Swing Dress. High Neck. NEW ASOS Navy Blue High Neck Jersey Swing Dress Size UK 10 Condition New With Tags Look stylish in this lovely soft stretch jersey swing dress with high neckline, open detail on the back and gathered detail on the cuffs. Measurements; Chest 36" Waist 42" Hips 54" Length 36" Care instructions Machine Washable If you have any questions please ask prior to purchase. I do not accept returns. Postage; I aim to post items as soon as possible but due to work this may be the next Saturday after purchase. Please leave feedback so I know your item has been received. Happy shopping! Do check out my other items as I am having a big clear out. 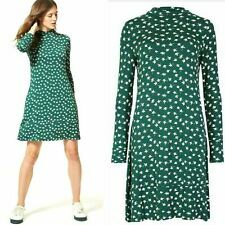 Womens Blue Floral Print H&M High Neck Long SleeveSkater Dress Size Small Condition is used, excellent with no flaws Dispatched same day with Hermes Tracked. NEXT Ladies Grey Knitted Dress Size 12. Condition is excellent. Grey colour, great fit with shaped panels to from & back. Polyester/viscose/elastase mix. Roll neck and long sleeves. L: 36" (Shoulder To Hem). - 100% Polyester. One Size - Fits 8-12. Long sleeved BLACK polo neck dress with a ZIP AT BACK. UK XS (6-8). ASOS PAISLEY SWING DRESS WITH POLO NECK. ALL OVER PRINT. 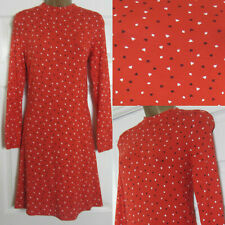 Glamorous Ladies Burgundy Polo Neck Swing Dress Uk Size Small Genuine!